GridCast: live and behind the scenes of grid computing: New GridCast.org is up online! New GridCast.org is up online! 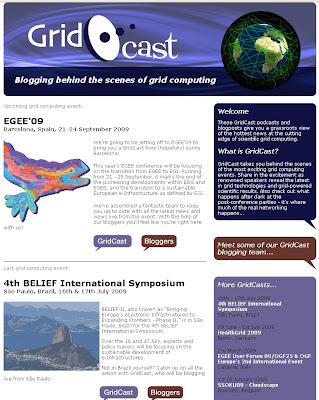 You may have noticed that the GridCast.org homepage looks a little different.. This is because our fab designers have had a bit of a redesign, making it even easier to catch up on all the action at grid computing events around the globe! The new site is up just in time for EGEE'09, and we've assembled a fab blogging team to take you through the week's events. So keep checking the GridCast blog to find out about all the research, news and discussions from Barcelona. Great job with the design!